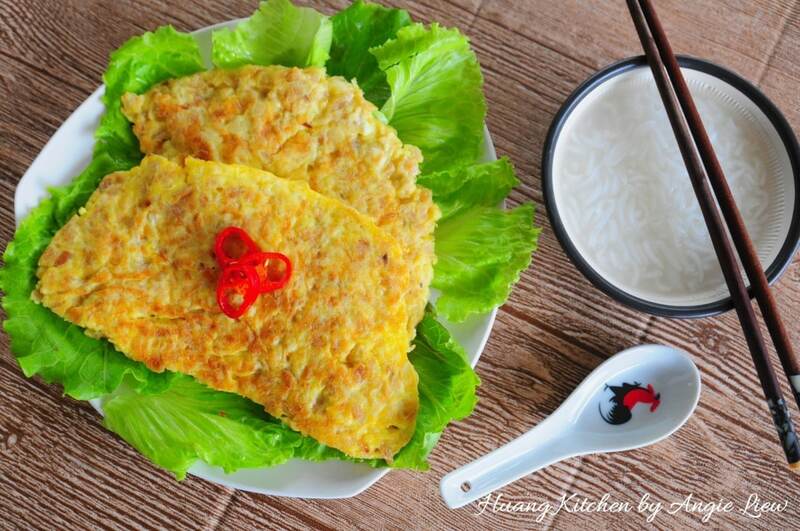 This Chinese-style Preserved Radish Omelette is another humble dish that most Chinese families are familiar with. This is a very easy dish that uses only a few ingredients, namely eggs, preserved radish, some minced meat and garlic. Also locally known as “Chai Po Neng”, it is a favourite childhood comfort food especially so for the Teochew families. It is a dish that brings back sweet memories and rekindles old taste. 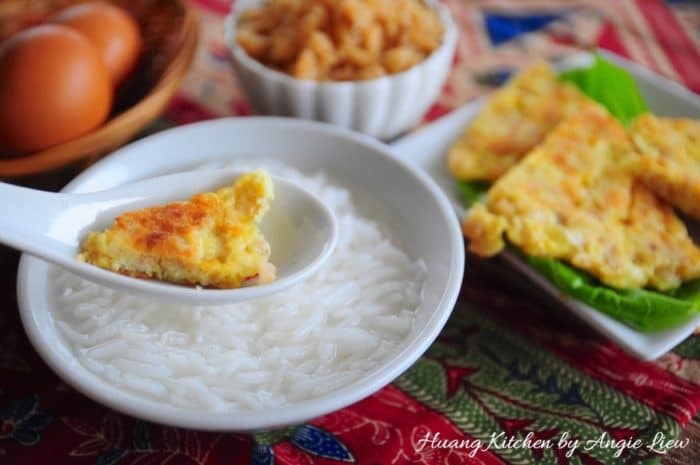 This omelette dish pairs extremely well with hot white porridge as the star of the dish, the preserved radish can be rather salty. The porridge balances out the saltiness making the omelette tastes just right and fragrant. This simple preserved radish omelette makes a scrumptious side dish in Chinese restaurants serving Teochew porridge. Yes, its the ultimate dish to go with any plain porridge meal anytime of the day. A delicious classic chinese omelette! 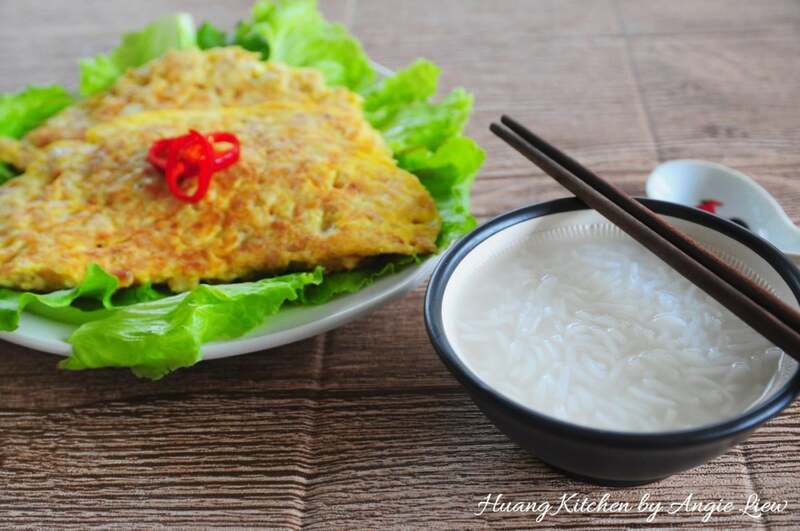 Filled with savoury preserved radish and minced meat, this simple omelette is just perfect with a bowl of congee and steamed rice. 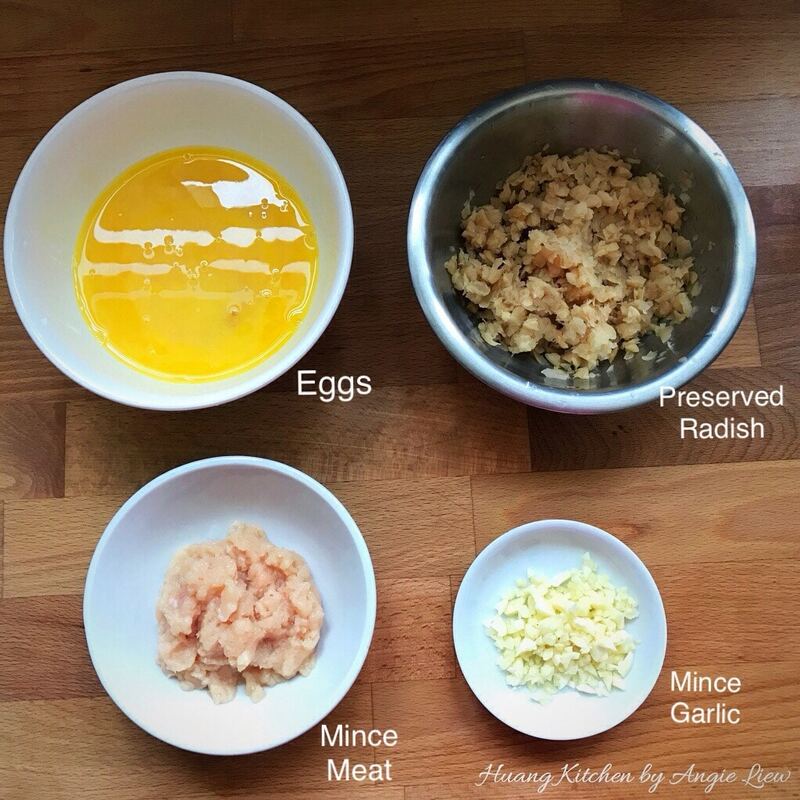 Have ready the ingredients which are eggs, preserved radish, minced meat and chopped garlic. Rinse preserved radish in running water. Then leave to soak in water for about 15 minutes. Next, drain the soaked radish through a sieve and squeeze dry before use. Break three eggs in a bowl. Whisk evenly using a pair of chopsticks until the eggs turn pale, light and with bubbles. Next, mince the meat and chop the garlic. And we're ready to fry the omelette. First, saute chopped garlic in a wok with 1 tbsp of hot oil. Then add in preserved radish, minced meat and seasoning. Stir fry over medium low heat till the preserved radish is dry and fragrant. Add the fried preserved radish mixture into the beaten eggs and mix well. Then heat up wok with 1 tbsp oil. When wok is very hot, pour in the egg mixture and pan fry over medium high heat till aromatic. Then flip over and fry till both sides are golden brown. And we're done! Dish out on serving plate and serve the fried egg omelette with a bowl of hot plain porridge. As always, Enjoy! Wash and drain the preserved radish for at least two times to remove excess salt in it. You can also opt to have half sweet and half salted preserved radish as this will balance out the saltiness for this omelette dish. To ensure the preserved radish to be fragrant, stir fry till dry first in wok. Do not flip the omelette until its light golden brown or it will break in the wok. If you prefer a more fluffy and crispy edge omelette, try to whisk the eggs till its very pale and you see a lot of bubbles. High heat is used to fry the preserved radish egg omelette so that the oil will not be retained resulting in an oily omelette.